I am a Geeky IT Guy and this is my Nerd-mobile. I Love cruising the highways and byways around Fort Worth area and looking for other zombie nuts – Whenever possible I grab some pics and here is my photo gallery of other Area Zombie-fied Rides. Check them out, Send me your photos, comment, or just chime in and share your favorite Zombie story. And here are links to some of my favorite posts and photo galleries of the Zombie Wrangler and it’s adventures. 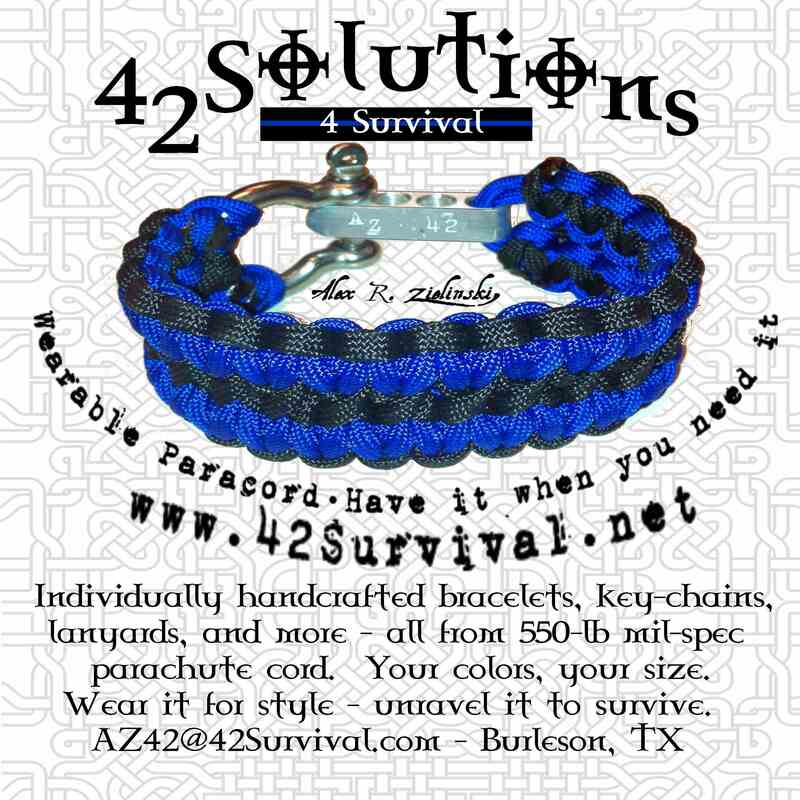 I do trade shows, craft fairs, and swap-meets, as well as online sales to support my Jeep habit – If you haven’t seen, or have seen and couldn’t afford a ParaCord Survival bracelet, Check these out. I have never seen your jeep in person but I also have a zombie response unit jeep but in Idaho! 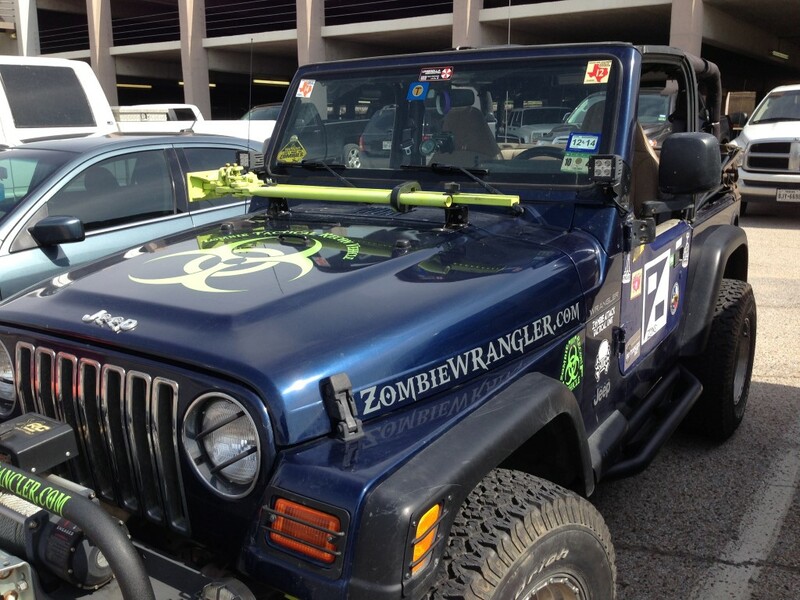 It’s awesome knowing there are other people that build their jeep up to the zombie theme. I’m not sure how but I could send you a photo of my jeep if you would like! Sure would love to see it. I have been negligent on maintaining the zombie vehicle gallery. Been snapping lots of photos with my phone, but keep forgetting to sit down and upload them all. Having a write in sounds like the spark I need to re-open the Z-files. If you want to tell me a bit about it I can even make you a whole post. email me – AZ@ZombieWrangler.com and Jeep on! I saw your wrangler yesterday and the element this morning on lancaster. See you down south alot also. Kinda cool seeing other people being creative too. I have the blue zombie cherokee you have probably seen dozens of times. Just saw you to our right on Beach St. while we were all stuck in traffic. It’s always nice to see curiosities around here. Awesome. I love turning heads, makes driving fun again. Awesome! I love making people smile. Also keep an eye out for our Honda – the Zombie Element, license plate XOMBE. Can’t miss TWD’s Rick Grimes on the back windshield in blood red vinyl. If you have a decal dream, let me know I have a laserpoint vinyl plotter and can cut out all kinds of shapes and lettering for a lot less than sign shops. AZ@ZombieWrangler.com. Have a Happy & safe (Zombie Free) New Year. Saw you on Wilshire in Burleson just now. Wondering though, what’s the bar on the hood of your jeep?? Lol. My boyfriend and I were driving on Whilshire in a blue truck when he points out that this Jeep says “ZOM B.” Then we noticed the rest of it and laughed about it. I noticed the web address and decided to check it out. This was a nice little find and I’m glad we saw it. I enjoy this kind of thing. I saw you on 35 northbound on my way to work the other morning and wrote down your site to check out when I had some down time. I’d love to have a jeep for Z Day. I’m currently trying to lock down a Delorean first as its my dream car lol. Saw you on Wilshire in Burleson. September 7.
saw you guys a few hours ago northbound on I35 W. gave the lady in the passenger seat a thumbs-up. Saw u on I35 N this morning around 830 am. Recently ran the Run For Your Lives zombie run, and your jeep peaked my interest in your website! And my friends said this Jeep wouldn’t do 80! Got the ticket for 83!! True, it was downhill and with the wind. I saw the Zombie Jeep at 5:41 5-3-13 on 35west heading south. Woot thanks for the comment – Email me AZ@ZombieWrangler.com and I’ll send you coupon code for a zombie awareness ribbon (May is Zombie Awareness month) and and a 42Solutions Paracaord bracelet for free (+ $0.99 Shipping) at my Etsy shop. your posts. A number of them are rife with spelling issues and I find it very troublesome to tell the truth however I will definitely come again again. Apologies, I am working on it – Typing is not one of my strong suits. Thank you for the encouragement, I hadn’t ever thought of a donate link. Usually it’s just me against the world. Check out funding source – 42Solutions[ http://www.etsy.com/shop/42Solutions ] I’d be happy to ship you a Zombie Support Bracelet.